At the end of the day, no matter what lofty legends institutions like The NY Times or Harvard try to carve for themselves, their primary allegiance is to their class interests and privilege, and that trumps everything else. The times props up the criminal status quo as much as Rupert Murdoch’s media, but the Times does it a lot more subtly. 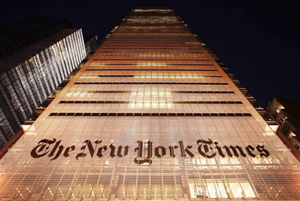 The documentary film “Page One: Inside the New York Times” is an infomercial for The New York Times. It says nothing about the internal dynamics of the institution. It fails to portray the titular Page 1 process. Most of the film is devoted instead to profiling the paper’s quirky media reporter, David Carr. This focus on Carr, who is at times engaging and at times pedantic, leaves viewers as ignorant about the workings of the paper as when they went into the theater. During the moments when “Page One” departs from the Carr narrative, it has no coherent pattern or internal logic. There are fleeting attempts throughout the film to acknowledge the wider institution. These scattered moments are abrupt and incoherent. Director Andrew Rossi throws out a dizzying array of issues, from the future of iPods to newspaper paywalls to the $250 million loan provided to the paper by the Mexican billionaire Carlos Slim but never adequately explores any of them. The scenes showing Carr slowly gathering string for a story and prodding sources to talk are the most engaging in the film and at least illustrate how labor-intensive and difficult good reporting can be. They remind us how much poorer we will be if there are no longer institutions that make this work possible. By the end of the film we get a sense of Carr, who is a talented and dedicated reporter, and a few of the stories he covered, from CNN’s bizarre affiliation with Vice magazine to Comcast buying NBC. Carr, irascible and funny, is deeply grateful to the paper for giving him a stable job, especially after his checkered past as a crack addict who spent time in jail. Again and again he defends the goodness, integrity and sagacity of his employer. But while Carr and others who are interviewed, including David Remnick, editor of The New Yorker magazine, pay homage to The New York Times’ greatness and importance, the Times itself remains, in effect, offstage. These hymns of praise become like the munchkins lauding the great and powerful Oz to Dorothy. Carr, whose personal history makes him an anomaly at a company that attracts well-heeled and often overeducated reporters, is shown at work on a 5,000-word investigative piece with his editor Bruce Headlam. The article details the mismanagement at the Tribune Co., which owns the Chicago Tribune and the Los Angeles Times. Carr exposes the “frat-boy culture” that plunged the Tribune Co. into chaos and bankruptcy. Sam Zell, the Tribune owner, is shown in the film making some truly stupid and disgusting statements, including deriding anyone who thinks journalism should contribute to the common good. Tribune’s onetime Chief Executive Officer Randy Michaels, who opened up his penthouse suite for long poker games, is not far behind Zell in his imbecility and outdoes him in personal impropriety. Two weeks after Carr’s article, Michaels is forced to resign. By comparison, of course, The New York Times looks majestic. Rossi also follows the publication of the leaked cables provided to the paper, as well as to Der Spiegel and The Guardian, by WikiLeaks’ founder Julian Assange. The struggle by the paper’s editors to deal with the controversial material illuminates the clash between the closed, insular world of the Times and the technological revolution that has overtaken them. Brian Stelter, the young reporter on the media desk with Carr who began his career as a blogger, and who Carr quips was perhaps a robot created in the basement of the Times to destroy him, rues the technological backwardness of the newsroom. Stelter rolls his eyes as he points out that editors at the paper leap on stories he read about hours earlier on his Twitter account. The editors are seen trying to make the 21st century world of the Internet, instant messaging and Twitter fit within the 19th century rules of newsprint. Susan Chira, the paper’s foreign editor, dismisses Assange as a “source,” although Times Executive Editor Bill Keller admits in the film that Assange is in fact a partner. Chira also confesses that she had never heard of WikiLeaks before the group put out its video of civilians being gunned down by U.S. troops in Iraq from a helicopter. Chira typifies many at the paper who appear to believe that nothing really exists if it is not covered by The New York Times. Those running the paper, we see in this moment in the film, are struggling to adapt. The contents of the WikiLeaks cables dominate the paper’s front page for several days. But editors make snide and condescending comments about Assange. They argue about whether he can be considered a reporter. They dismiss him as an activist. And their smugness not only implies that they alone work from pure, honest and disinterested motives, but exposes their insecurities in a media landscape that on some level no longer needs them. The documentary touches on, although without much background information, Judith Miller, the reporter turned stenographer for the Bush White House in the buildup to the Iraq War, and Jason Blair, the habitual liar who falsified and plagiarized stories. Miller and Blair—and I was working for the paper when each of these scandals occurred—were not, as the film implies, rogue reporters who beguiled their way into a trusting newsroom. They embodied the most serious institutional failures. A more sophisticated filmmaker like Fred Wiseman, who had asked the Times management several times if he could film a documentary in the newsroom and was turned down, would have known what to do with this material. Miller and Blair were given free rein by senior management because they exhibited the amorality that is prized by the management. They served only their own careers and those editors who could make those careers advance. They were grotesque prototypes, to be sure, but they exemplified the subservience to authority and abject careerism that poisons the institution. Blair and Miller, whose behavior was reprehensible, were fired. But they were also scapegoats. They, and many at the paper, have no real moral compass. They know the rules imposed by the paper’s stylebook. They know what constitutes a “balanced” story. They know what the institution demands. They work hard. They have ingested the byzantine quirks and traditions of the paper. But they cannot finally make independent moral choices. The entire paper—I speak as someone who was there at the time—enthusiastically served as a propaganda machine for the impending invasion of Iraq. It was not only Miller. The film should have looked more carefully at the colorless editor of the paper, Bill Keller, who will step down in September. Keller, who had been given a column as a consolation prize when he was first passed over as editor for the hapless Howell Raines, served, as faithfully as Miller, la causa. He was a vocal cheerleader for the war in Iraq. In one column he called for the firing of then-Secretary of State Colin Powell because Powell wanted U.N. approval for an invasion. He wrote glowingly about Paul Wolfowitz. And once he was in charge of the paper he placed Sam Tanenhaus, a conservative admirer of William F. Buckley, in charge of the Book Review section and the Week in Review. Keller, whose on-camera comments are bland and vapid, represents the ascendancy of neocons inside as well as outside The New York Times. This process of ideological reconfiguration, first begun by the paper’s Editor Abe Rosenthal in the 1980s, was accomplished through a series of purges, persecutions, firings and dismissals as well as the appointments of those who, like Tanenhaus and Keller, have little allegiance to the tenets of traditional liberalism, tenets that made a free press possible. Senior editors such as Keller and Tanenhaus are products of the time. They do not question the utopian faith in globalization. They support preemptive war, at least before it goes horribly wrong. And they accept unfettered capitalism, despite what it has done to the nation, as a kind of natural law. The reigning corporate ideology has infected the Times as it has most other liberal institutions. Because this ideology does not challenge the status quo it is defended by these editors as evidence of the paper’s impartiality, balance and neutrality. ExxonMobil, Citibank and Goldman Sachs are treated with deference and respect. The inability to see that major centers of corporate power are criminal enterprises that are plundering the nation and destroying the ecosystem is evidence not of objectivity but moral bankruptcy. The Times, like Harvard University, where I attended graduate school, is one of the country’s most elite and exclusive institutions. Its ethos can be best summed up with the phrase “You are lucky to be here.” That huge numbers of people at The Times, as at Harvard, buy into this institutional hubris makes the paper, where I spent 15 years—nearly all of them, thankfully, as a foreign correspondent a few thousand miles from the newsroom—a fear-ridden and oppressive place to work. The Times newsroom, like most corporate nerve centers, is a labyrinth of intrigue, gossip, back-biting, rumor, false piety, rampant ambition, betrayal and deception. Those who play this game well are repugnant. They are also usually the people who run the place. When you allow an institution to provide you with your identity and sense of self-worth you become an obsequious pawn, no matter how much talent you possess. You live in perpetual fear of what those in authority think of you and might do to you. This mechanism of internalized control—for you always need them more than they need you—is effective. The rules of advancement at the paper are never clearly defined or written down. Careerists pay lip service to the stated ideals of the institution, which are couched in lofty rhetoric about balance, impartiality and neutrality, but astutely grasp the actual guiding principle of the paper, which is: Do not significantly alienate the corporate and political power elite on whom the institution depends for access and money. Those who master this duplicitous game do well. Those who cling tenaciously to a desire to tell the truth, even at a cost to themselves and the institution, become a management problem. This creates tremendous friction within the paper. I knew reporters with a conscience who would arrive at the paper and vomit in the restroom from nervous tension before starting work. If Rossi had examined the effects of this institutional hubris and the pathology of the paper’s self-infatuation, if he had looked at the paper’s large and small failures as well as its successes, he would have pushed past the myth of the Great Oz, peddled to him by the paper’s editors and minions like Carr, and uncovered its troubled core. Notice to our audience: All comments suspended until further notice due to spamming and defamation/harassment threats. Check Facebook’s Links for the Wild Left for comment threads on our articles. VISIT OUR STORE FOR THIS AND MORE POLITICAL EXPRESSION PRODUCTS. Posted in AMERICAN BRAINWASH, IDEOLOGICAL COMBAT, MEDIA. A lot of Internet info is incorrect, innacurate, and useless. But then so is much of the information provided in newspapers. Traditional newspapers have been mostly useless for much of their existence, and they still are. Most news stories are unreferenced, frequently incorrect and badly researched, unconfirmable, and filled with endless speculations that never come true, since no one, including reporters, knows the future. A documentary like “Page One” shows quite clearly that reporters and media people just don’t get it. They don’t understand why the public are unhappy with their product, and they don’t get why people are now beginning to seek their info from other sources – ANY sources – even the Internet – which occasionally DOES contain some information and research far more accurate than that provided by newspapers in general. And rather than change – and subject their research to rigorous standards of accuracy (as in Japan) – Western media sources resist change at all levels, and newspapers remain just as innacurate and badly researched as ever. I myself will be glad to see the media disappear. I am absolutely fascinated to see what Crichton predicted years ago actually happening, and it’s about time. Thanks for the excellent comments. I totally agree that every bit of “news” is announced with the bravado of a town crier working on commission.